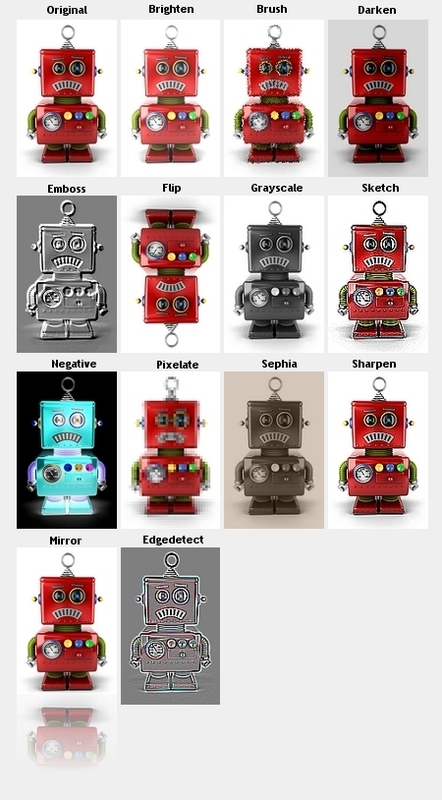 Image Filter GD is a set of image effects filters that can be applied to a linked image using a MyCode tag. 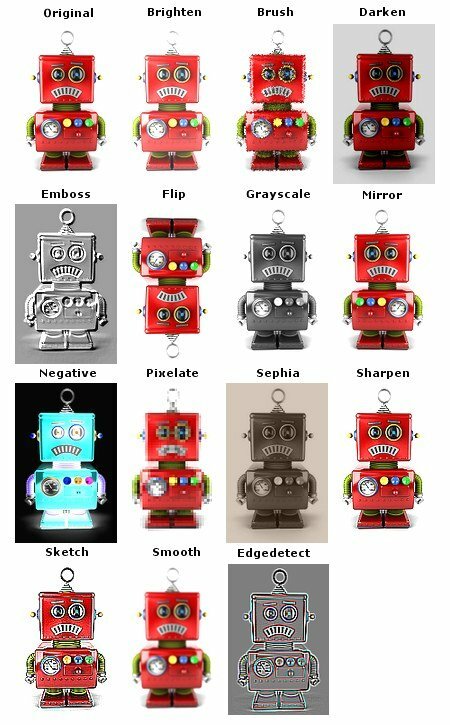 Image Filter GD is a set of image effects filters that can be applied to a linked image using a MyCode tag. Transparency is retained for most transparent GIF and PNG images. brighten: Lightens a darker image. brush: Adds a slight dabbed, brushed effect to an image. darken: Darkens an overly bright image. 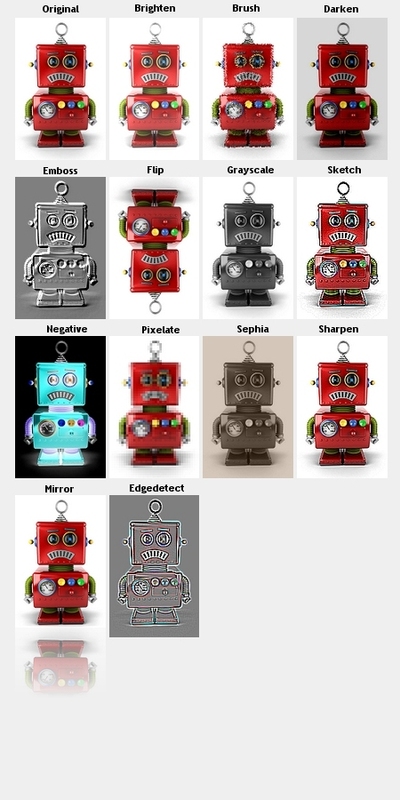 edgedetect: Highlights borders between colors on an image. Similar to emboss. emboss: Adds a stamped metal effect to an image. flip: Flips an image vertically. 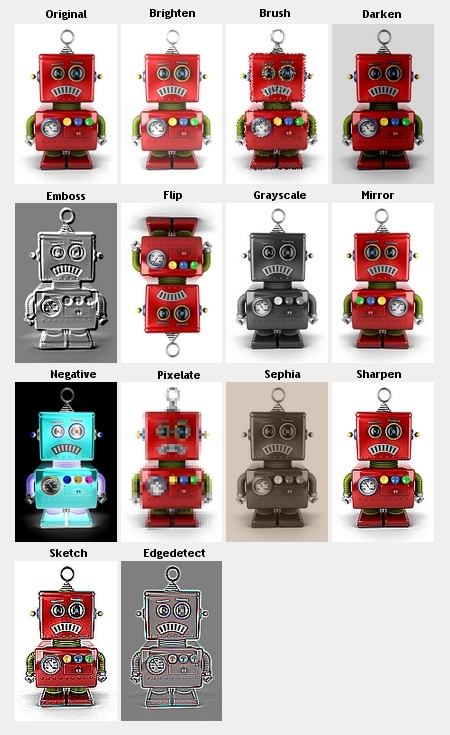 grayscale: Converts color image to black & white. mirror: Produces a mirrored reflection of an image. negative: Produces a photo negative of an image. sephia: Adds an aged photo effect to an image. sharpen: Sharpens an blurred image. sketch: Adds a sketched, comic book effect to an image. smooth: Slightly blurs an overly sharpened image. Only supports GIF, PNG and JPG/JPEG images. If using the Image Resizer & Optimizer GD plugin, you must set the Overide dynamic resizing and optimization to On. Only the first frame of animated GIF images is processed. Therefore the image is returned as a static image. 1. Unpack the Image Filter GD zip file and upload imagefilter_gd.php and the imagefilterGD folder to in inc/plugins directory. 2. Go to your Admin Plugins Manager and activate Image Filter with GD. 3. Go to your Admin MyCode Manager and create a new MyCode tag. Give it a title and description. 4. Enter the following code as the Regular Expression. 5. Enter the following code as the Replacement. 6. Enable the MyCode tag. Plugin has no settings. Enable/Disable via the MyCode Manager.